My China travel pal and I were talking about how we missed all the foods we sampled in China. At the time I was not all that impressed. We ate at many different places of various prices and quality, and although most of the meals were good none really stood out to me as “great”. Charley did like the Beijing King Wah Restaurant, a fairly nice place that specialized in Peking Duck (aka Beijing Duck). Duck is enough of a treat in China that you can expect to pay about $15 per person – an exceptionally high amount when alternative large meals will run $5 – $10 per person for a huge selection of food. Street food – much of which is very good – is practically free. 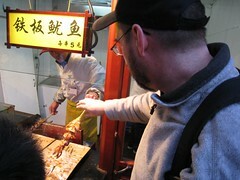 These squids on a stick were 5 yuan= .75 In fact my favorite meal of all was Won Ton Soup in Shanghai. The hand made Won Ton were fresh and spectacularly good, served to the bowl after boiling in a huge pot of delicious broth along with deep fried bready things. 75 cents for a meal sized bowl. This entry was posted in Beijing, china, tourism, travel. Bookmark the permalink.